Thanksgiving: a scheduled holiday observed on the fourth Thursday of every November… it gives Americans the opportunity to stop, remember, and be thankful. What a great holiday! However, I’m convinced that thankfulness should be more than an annual occurrence. We need to be thankful people year round. Over the past few days I’ve been thinking about that in my own life. Why do I need a national holiday to remind me to be thankful? Don’t get me wrong… I’m thankful for Thanksgiving (it’s probably my favorite holiday of the year… all the food, all the family with MUCH LESS FUSS AND STRESS than the holiday that follows) but shouldn’t we (I) be thankful for ALL THE BLESSING ALL THE TIME? So, where does a thankful/grateful heart start? It starts and is formed in the hearts of children. I understand that parents have the greatest influence over their kids and parents really do mold attitude… but can’t we partner here, too? Leading kids to be thankful, appreciative, and grateful can really influence who they become, how they are perceived, and really how they view their world. Say "Thank You" to your kids and remind them to say "thank you" too. It’s a simply thing, but one that really the tone for an appreciative heart. Remind kids to say "Thank You" to each other. Lots of kids have manners with adults… fewer share there thankfulness with their friends. "Thank you" is appropriate amongst peers, too! I’ve noticed that some kids don’t realize just how good they’ve got it. Create an attitude of thankfulness by leading kids to list those things for which they should be thankful. Don’t limit the thankfulness to "big ticket items" but have kids consider the simple necessities that are sometimes taken for granted. Help kids learn to give. I’ve also noticed that the kids I teach seem to have everything they want and often times don’t understand the concept of giving (or sharing). Help kids in your ministry be more appreciative of what they have by sharing what they have and giving to those who aren’t as fortunate. When appropriate, have them directly involved in the giving process (not just the collecting). If appropriate, help kids see how much they have and how thankful they should be by volunteering and participating in ministries that help those less fortunate than they. Your church clothes closet, food pantry, and homeless shelter would be an excellent controlled environment to have kids participate. I’ve asked God to help me be more aware of my blessing, be more grateful for them, and be more appreciative. Above all, I want to be more thankful to the One from Whom all blessings flow. 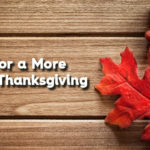 Join me in having a Thankful Thanksgiving!